Surprising perhaps even himself, Jasper Stuyven (Trek-Segafredo) was able to hold off the scrambling chase group and grab a rare solo victory in Kuurne-Brussels-Kuurne. 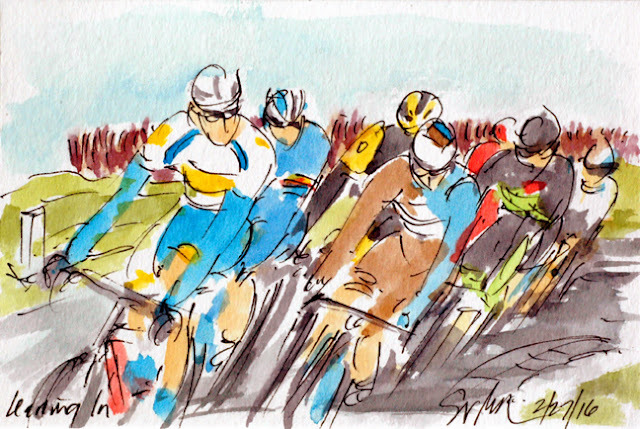 This race with its relatively smooth flat 50 kilometers is normally a race for the sprinters and is noted for its group sprints. Today, however, it was proven that nothing in cycling is a given, and if you have the will and the legs, you can take the race in hand on your own. It doesn't hurt if the group chasing is also hoping to get those further behind back into the race. This is a small original watercolor and ink painting that was created using Yarka St. Petersburg watercolors and Steve Quiller brushes from www.richesonart.com. This painting and many, many other pieces of cycling art are available through my artist website at www.greigleach.com. To purchase this particular painting, just follow the direct link at the end of this post. And yes, international shipping is available. 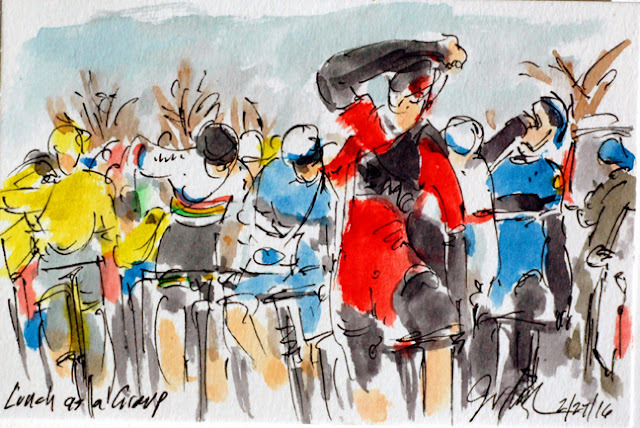 Plus, I have just released my second book, this one entitled, Art of Cycling: Richmond 2015 UCI Road World Championships. 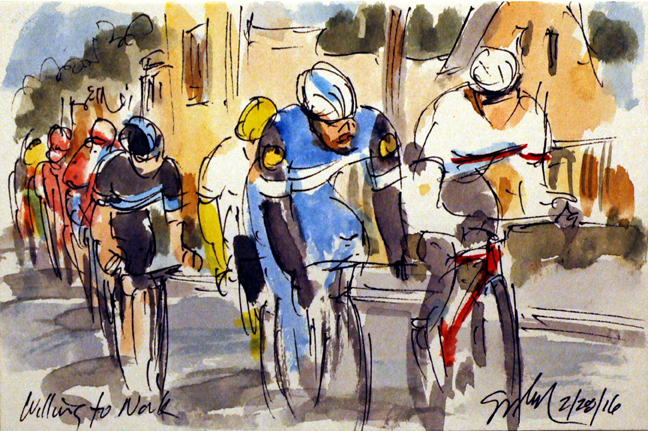 Obviously, it focus on the 2015 Championships that took place here in Richmond, Virginia this past September and includes my paintings and writings on all of the races contested on the very streets that I ride every week. I am having trouble with loading my artwork on to my website. Please email me at greigsart@gmail.com if you are interested in purchasing this work, or any of my other Kuurne-Brussels-Kuurne paintings. With the break away sucked back into the fold by the leading group of chasers it was time to launch the counter attack. It was Jasper Stuyven (Trek-Segafredo) that decided that he had the legs to go from almost 20 kilometers out. Before he attacked, Pim Ligthart (Lotto Soudal) had been disrupting the flow of the group trying to slow it down enough so that his team leader could catch back onto the tail of the leading 15. 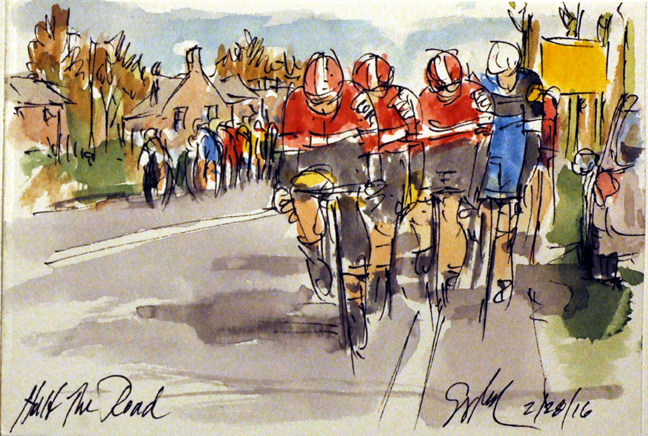 When Stuyven went, Ligthart happened to be on his wheel, given the Lotto Soudal rider's objective, he allowed the gap to open and none behind were ready to put in the chase. Nor willing to drag everyone else along to catch the fleeing man from Belgium. A smaller group of 15 riders that included some big names had used the final climb of the day and the strong cross winds to get away from the main peloton, but still had a few remaining members of the early break up the road. Both Trek-Segafredo and Etixx-Quickstep had the luxury of having two men in the group. Boy Van Poppel (Trek-Segafredo) was working for his teammate, Jasper Stuyven, but Tom Boonen (Etixx-Quickstep) was willing to share the work with his domestique, Julien Vermote. Boonen had missed the move in yesterday's Omloop Het Nieuwsblad and wasn't willing to let the opportunity for victory elude him again. With the final cobbled obstacles done and dusted, it was time for teams to get their sprinters organized and to make sure that they would have the energy to power through to the line in Kuurne. Florian Senechal (Cofidis) dropped back to his team car along with his sprinter, Nacer Bouhanni, to grab a few power bars and to shed some extra layers. By this point the cold air was being super ceded by the generate body warmth of the effort of the race. In the northern reaches of Europe (and many other places in the world) the winds sweeping across the wide open flat lands can really effect the course of the race. When the winds come at the riders from one side or the other, the peloton will form echelons (where each following rider is behind and to the side of the preceding cyclists - trying to find the spot in his draft). Teams will move over to allow only their teammates to be able to find the sweet spot for the draft, leaving those behind to work just that much harder to keep up. 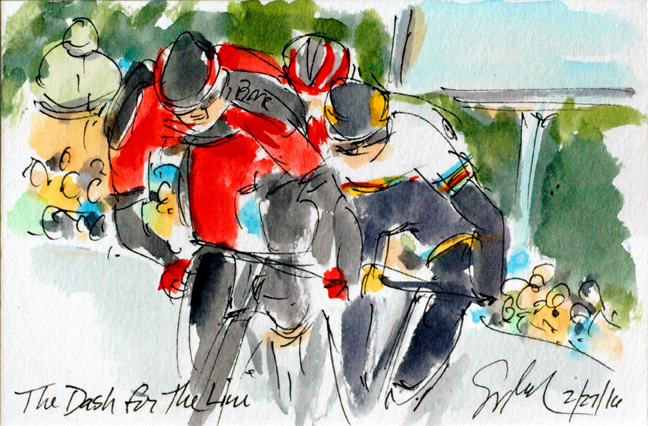 The Belgium team Lotto Soudal knew this tactic all too well, and employed it to perfection today, splitting the peloton apart and ridding themselves of some of the competing sprinters or rival teams. Perhaps ruing having too many competitors at the end of yesterday's Omloop Het Niuewsblad, Peter Sagan (Tinkoff) hit the front early, leaving all but Jasper Stuyven (Trek-Segafredo) behind. 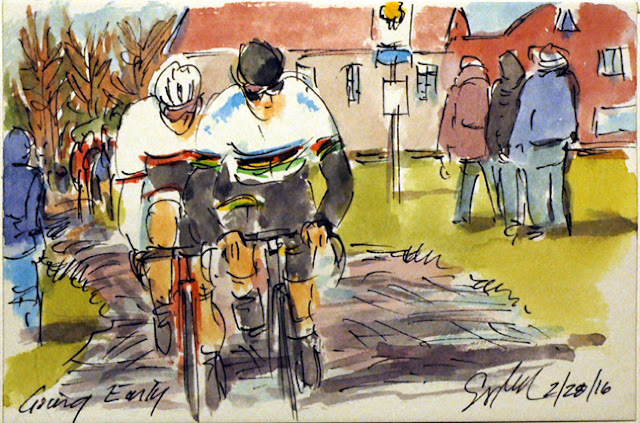 Sagan used the penultimate climb of Oude Kwaremont to gain a few seconds on the others, but with almost 70 kilometers left to race, it was surely too early to put his nose into the wind. The roads that the peloton are trying to squeeze onto in Belgium are smaller than the bike trails around my adoptive hometown of Richmond, Virginia. I get nervous doing a group ride of thirty riders on the Capital Trail, so I can't image what it is like to ride out with almost 200 riders on these roads. That alone would be enough to make me fight to be in an early break. This group got away just after the end of the neutral zone. Tucked onto the back of the group is Jaap De Man (Team3M), along with Bjorn Thurau (Wanty Group-Gobert) and Sebastien Turgot (AG2R) to mention a few of those laboring off the front of the peloton. The final kilometer of today's contest was a long drag up to the line with the notorious wins of the north blowing right into the faces of those that remained of the attacking riders. Today, Greg Van Avermaet (BMC) was finally able to gain the top step of the podium in one of his home country races. Tucked onto the wheel of Van Avermaet was the Rainbow Jersey of Peter Sagan (Tinkoff) but he was unable to get around the Belgium power house. It was a reversal of the move that one Sagan his Championship title just six months ago on 23rd Street in Richmond, VA. Finishing out the top three was the other man from Belgium, Tiesj Benoot (Lotto Soudal). Unable to match the accelerations of these three were, Luke Rowe (Team Sky) and Alexis Gougeard (Ag2r La Mondiale). 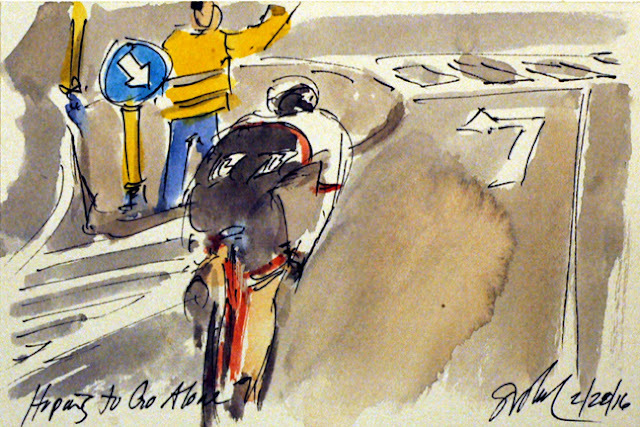 This is a small original watercolor and ink painting that was created using Yarka St. Petersburg watercolors and Steve Quiller brushes from Jack Richeson and Company, www.richesonart.com. Plus this painting is avialable through my artist website at www.greigleach.com. Just follow the direct link at the end of this post to purchase your piece of this early spring semi-classic. International shipping is available. Then there is my new book of the 2015 Road World Championships entitled, Art of Cycling: Richmond 2015 UCI Road World Championships. 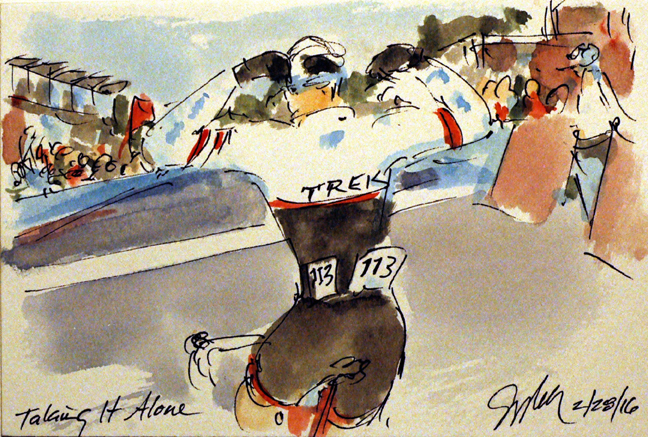 Available world wide and at www.artofcycling.bike. 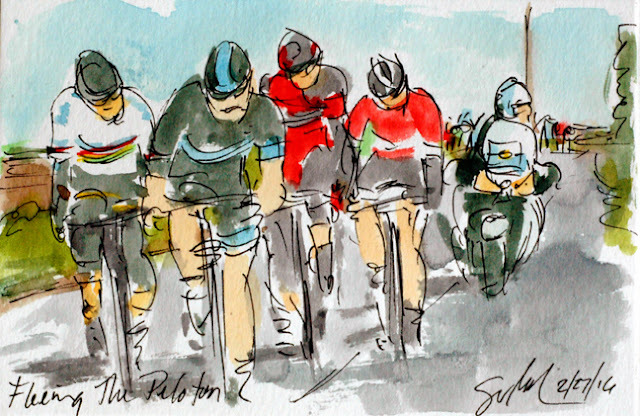 With just eight kilometers left to race and the peloton still over 45 seconds behind, it was looking like it would be one of these five men who would take out the win in Ghent. Alexis Gougeard (Ag2r La Mondiale) was the only one left of the original 12 man break, it is a true testament to his form that he is still out front hanging on to the wheels of some much fresher and more favored riders. He must have felt proud to know that he was hanging with the Rainbow Jersey of Peter Sagan (Tinkoff) as well as Greg Van Avermaet (BMC), Tiesj Benoot (Lotto Soudal) and the ever fiesty, Luke Rowe (Team Sky). Rowe wouldn't let Gougeard skip pulls on the front, nor was he about to give the Frenchman a free tow to the line. Perhaps tired of the shadow boxing in the peloton, or just feeling strong on the cobbles, Jasper Stuyven (Trek-Segafredo) jumped out from the main group in a solo effort to bridge across to the big names up the road. 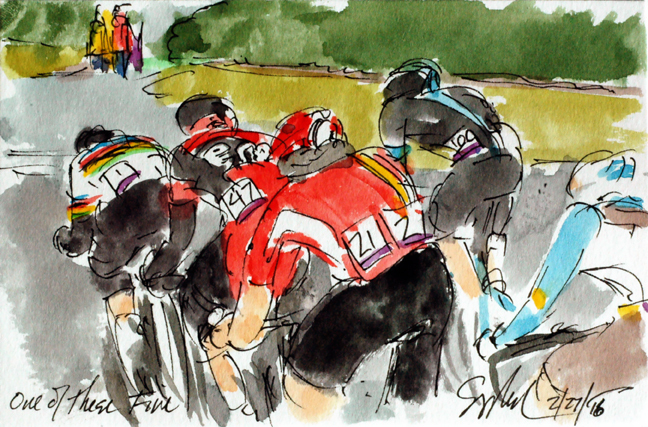 Stuyven gained a quick 30 seconds on the peloton, but then it seemed to reach a stalemate. He was neither gaining on those up the road nor getting further ahead of those behind. Unfortunately for the man from Belgium, he over cooked in on one of the main sharp corners and slid into the muddy gutters along the side of the sections of pave. However the only thing that was injured was his chances to make it to the leaders. So it was that he returned to the peloton, muddy and a bit shaken up. Everyone was expecting the move on the final climb of the day to come from Etixx-Quickstep and Tom Boonen, even the Cycling.tv commentator, Rob Hatch. However it was Daniel Oss (BMC) who launched the move, one that was quickly covered by Luke Rowe (Sky), Peter Sagan (Tinkoff) and Tiesj Boonet (Lotto Soudal), Joining them was Oss's teammate, Greg Van Avermaet who has been on the podium of this race, but has yet to reach the top step in numerous attempts. Given the pedigree of these four riders, this could well be the winning move even though there is still 50 kilometers of racing yet to unfold. There is a reason that there are teams in a bike race. And each member of a team has a particular role to play. Some like Jens Keukeleire (Orica-GreenEdge) are the "protected riders" those that are designated to have the best chance to win the race for the team. Others, like Keukeleire's teammate, Alexander Edmondson, are called domestiques, and are in the race to aid the goals of the protected riders on their team. Keukeleire had a flat on the rough cobbled roads that are a feature of the Belgium races, and Edmondson realizing his man was in trouble, stopped, removed his own rear wheel and switched it onto his teammates bike. This allowed Keukeleire to get back into the race much quicker (although it could have gone better had Edmondson not had so much trouble making the trade). 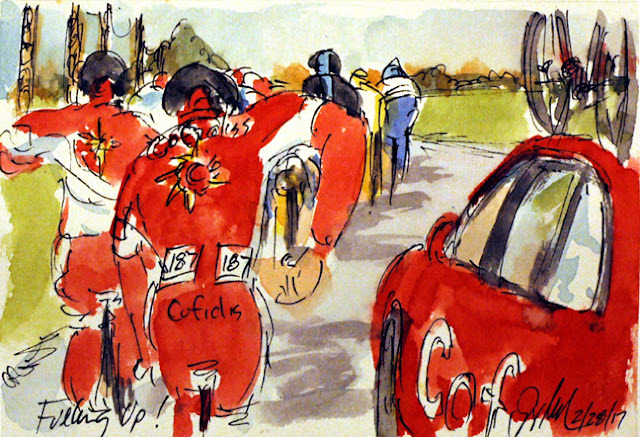 It was Hugo Hofstetter (Cofidis) who was the first to drop back from the early break. He is looking back over his shoulder as the Lotto Soudal and Trek-Segafredo lead peloton comes up from behind. At this point the riders had cover most of the short steep and oft cobbled climbs of the day and it was now time to get down to putting the favored riders into position. The first step in that process would be to gather up all of the early break away. They can now tick one off of that number. The race saw the usual early break, one that build up a gab of almost six minutes before the peloton set off in pursuit. 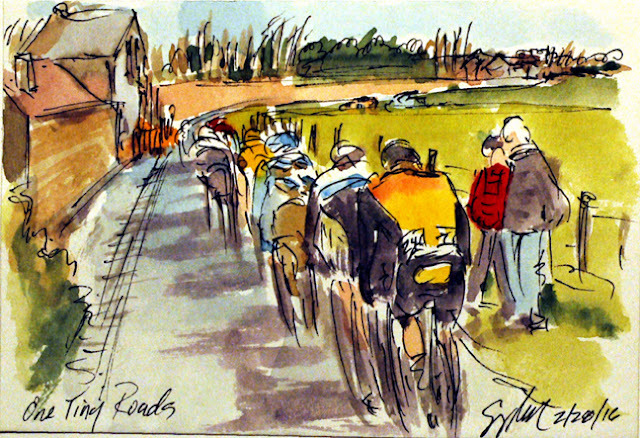 As one would expect, the group of twelve was mainly comprised of the Continental squads mainly from Belgium, Amongst those in the escapees where Maixme Farazijn (Topsport-Vlaanderen), Stef Van Zummerin (Veranda's Willens), Julien Morice (Direct Energie), Hugo Hofstetter (Cofidis). The only member of a ProTour team was Alexis Gougeard (Ag2r La Mondiale). 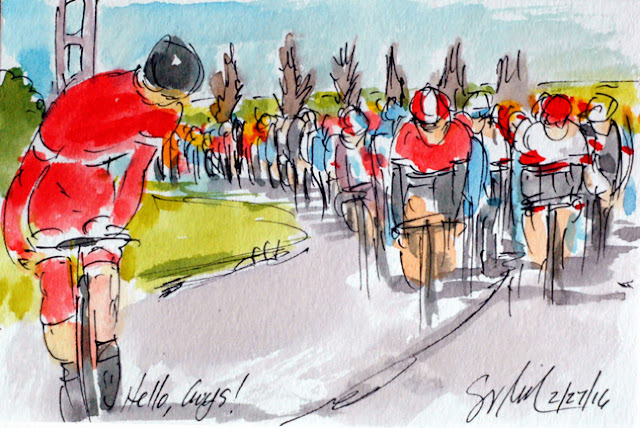 As they swung through one sharp corner after another they knew that the peloton was growing ever closer. 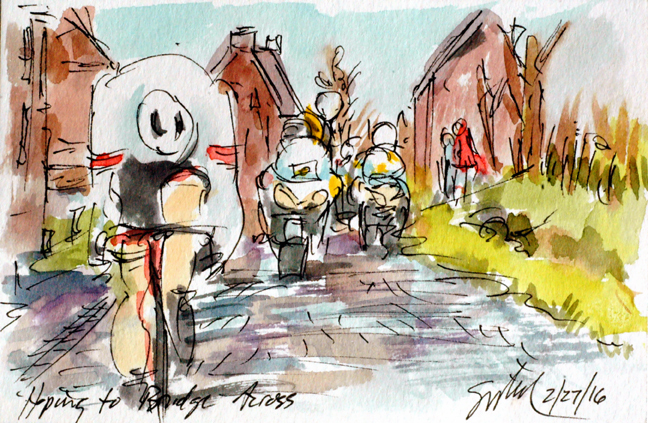 Omloop Het Nieuwesblad marks the peloton's return to Europe and the cobbles of the North. As the riders face the cold winds and rough roads of Belgium in late winter, food is an all important factor in providing the energy to complete the 200 kilometers from Ghent all the way back again. Tucked into the front of the group is Peter Sagan (Tinkoff) proudly wearing his new won Rainbow Jersey of Road World Champion. Would today be the day that sees the Champion's jersey is the first to cross the line back in Ghent? It hasn't happen since I was last racing in 1977. 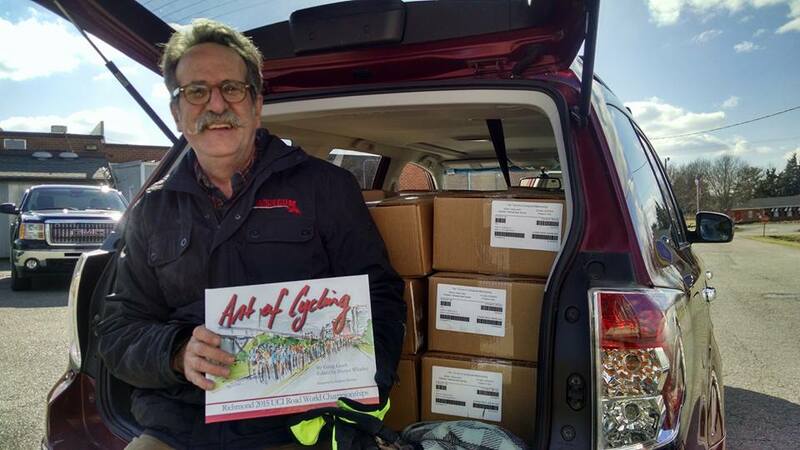 My newest book of the Richmond 2015 UCI Road World Championships was just delivered from the printers (based in the USA). I went out to the deep West End of Richmond to pick up my share of the shipment and I am very excited to hold this labor of love in my hands for the very first time. I feel a little odd meeting a truck in the back of a parking lot to pick up 470 books, but my publisher was there getting his share too. This is a hard bound 158 page book of my paintings and writings on all of the races of the 2015 Road World Championships. This book captures all of the speed, color and beauty of the races along with images of the city I now call home. 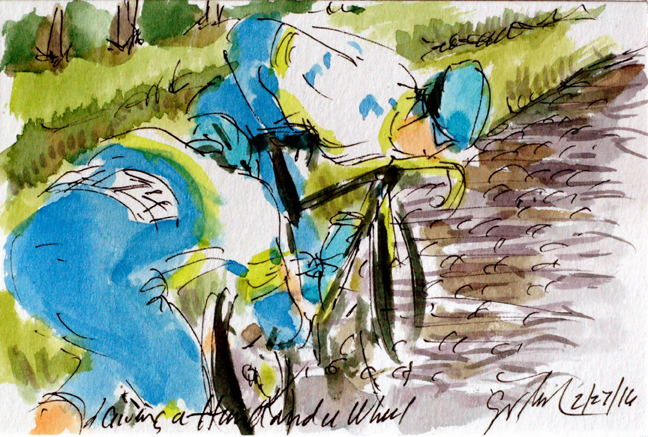 You can order your copy by going to www.artofcycling.bike, international shipping is available. The book retails for $29.95 USD plus shipping. The book also has a brilliant foreword by Kathryn Bertine and notes from the CEO of Richmond 2015, Wilson Flohr and Mayor Dwight Jones.